For years I've relied on Chow's brownie recipe for superlative brownies at that perfect halfway point between cake and fudge. But then I realized that, having tweaked it here and there over time, I wasn't making Chow's recipe any longer. Here's the version I make at home. In a medium saucepan, combine the chocolate and butter and cook, stirring frequently, over medium-low heat. When the chocolate and butter are evenly melted, remove from the heat and let cool while you mix the rest of the ingredients. In a medium bowl, combine all of the remaining ingredients except the flour. Stir in the butter-chocolate mixture, then stir in the flour. Scrape the batter into the prepared baking dish and spread it out evenly. Bake until a tester inserted in the center of the brownies comes out mostly clean with only a few crumbs attached, about 25 to 30 minutes. Remove from the oven and cool at least half an hour before cutting. Cut the brownies in the pan or, if you used aluminum foil, use the edges of the foil to lift the sheet of uncut brownies out of the pan before cutting into squares or rectangles. 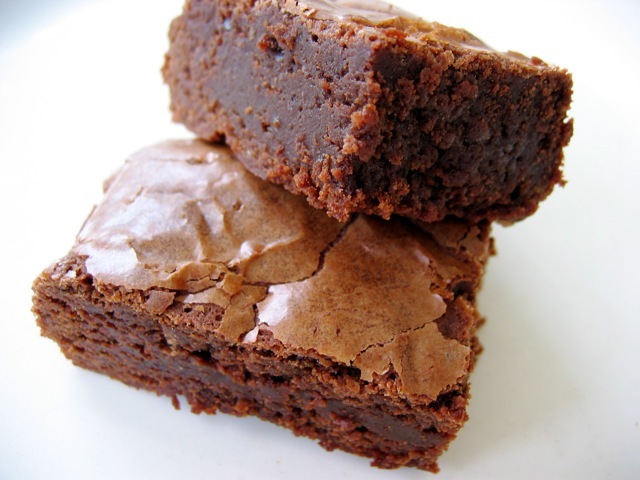 Variation: For chocolate-mint brownies, skip the cinnamon and replace the vanilla with 2 teaspoons mint extract.